President Shimon Peres says he is determined to end his term in July, as scheduled according to the law. President Shimon Peres said on Wednesday that he was against any initiative to extend his term in office. 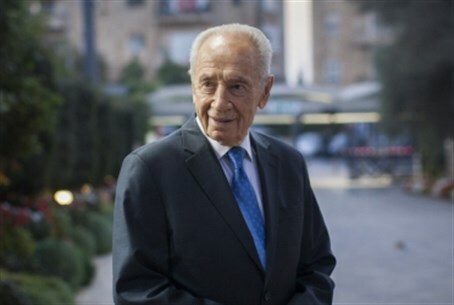 Peres “is determined to end his term according to what is stated in the existing law, at the end of July 2014,” said a statement from his office. The statement came in the wake of a report on Army Radio which said that Prime Minister Binyamin Netanyahu was looking into the possibility of turning the election of the president into a popular vote instead of having the Knesset members elect the president. "In light of recent reports, the President wishes to clarify unequivocally that he opposes any proposed changes,” said Peres’s statement. The Army Radio report from Wednesday morning explained that Netanyahu’s plan was connected to the difficulty in choosing a suitable presidential candidate for the Likud. Netanyahu is not on good terms with either MK Reuven Rivlin or Minister Silvan Shalom, both potential candidates from the Likud. He also cannot openly support the candidacy of MK Binyamin Ben-Eliezer, since he will be the candidate of the opposition. Ben-Eliezer has already collected ten signatures and has been endorsed by his Labor party. The Yisrael Hayom newspaper reported on Sunday that Tourism Minister Uzi Landau of Yisrael Beytenu was considering running for president and would be endorsed by Netanyahu and Foreign Minister Avigdor Liberman and Prime Minister Binyamin Netanyahu if he does. Former Knesset Speaker Dalia Itzik has begun to collect signatures from MKs, with Shas’s Yaakov Margi being the first one to sign for her. Other candidates in the presidential election include Nobel Laureate Professor Daniel Shechtman, who recently announced his candidacy. Shechtman's announcement made waves when he declared that he wants to be "a man of the people" and not identify himself with a specific party. Wednesday was not the first time that reports have surfaced about a possible extension of Peres’s term. There were reports in early November that either Peres, his supporters or Netanyahu were seeking a legal way to extend his term. “I’m finishing my term in July according to the law. If Members of Knesset try to extend my term, I will object to any such initiative,” he said.